We ended Part Two of the series with the death of Edward VI on the 6th of July 1553. In this, the final article in the series, we will observe the short reign (13 days, not 9) of Queen Jane and discuss her execution. On the 21st of June 1553, the Letters Patent was signed by 102 noblemen, London aldermen, bishops, archbishops and councillors – this was pretty much every politician that was available.¹ These letters patent were issued stating that King Edward VI’s heir would be Lady Jane Grey, the daughter of Frances Brandon. Frances was the daughter of Mary Tudor and Charles Brandon. But before we go too deep into that let’s look at what had happened before Edward became King of England. In the Will of Henry VIII it was laid out exactly how the King wished for it to be for his son as a young monarch. It was obvious that he wanted his son to have the best, and to continue on with the Tudor dynasty. When Edward VI created his “Devise for Succession” he wasn’t trying to overthrow his father’s 1544 Act, he was merely trying to follow in the footsteps of his father, Bluff King Hal. Edward’s “Devise for Succession” had been sent to Parliament, just as his father’s had, unfortunately there would not be enough time for it to be passed prior to his death. If it had been passed things may have turned out differently. For lack of [male] issue of my body to the male issue coming from this female, as I have after declared. To the Lady Frances’ male heirs if she have any such issue before my death, to the Lady Jane and her male heirs, to the Lady Katherine’s male heirs, to the Lady Mary’s male heirs, To the male heirs of the daughters which she shall have hereafter. Then to the Lady Margaret’s male heirs. For lack of such issue, to the heirs male of the Lady Jane’s daughters. To the heirs male of the Lady Katherine’s daughters, and so forth until you come to the Lady Margaret’s daughters’ heirs males. There are four more paragraphs, if you’re interested in reading more I recommend using Google and searching “Devise for Succession” and you will fin your way around. It wasn’t even clear that Edward even had the authority to alter his father’s will, particularly as Parliament had granted Henry the right to dispose of the crown. Even the Chief Justice, Sir Edward Montague, had a hard time believing that Edward’s devise would overthrow his father’s 1544 Succession Act – however, with a bit of royal and political pressure Sir Edward Montague was convinced to change his mind, and was given a pardon for his attempt to stop the King’s wishes. Unfortunately, for Mary the preparations for Jane’s proclamation were already under way and the following day Jane was proclaimed queen. It was between four and five in the afternoon, Lady Jane Grey, her husband, Guildford Dudley, her parents and mother-in-law arrived by barge to the Tower of London. As the large Tower gates closed behind them, a blast of trumpets grabbed the crowd’s attention. It was there, that two heralds then proclaimed that Lady Jane Grey was Queen of England. A Genovese merchant by the name of Sir Baptista Spinola, described the situation as such: Jane was wearing a green gown embroidered with gold, large sleeves and a very long train. Jane’s headdress was white and heavily jeweled. By her side was her young, tall and blonde husband, Guildford Dudley, dressed in white and gold – he appeared attentive to Jane’s needs. Spinola was apparently close enough to notice that Jane had small features and a well-made nose, the mouth flexible and the lips red. The eyebrows are arched and darker than her hair – which is nearly red. He also described her as thin and very small even though she was wearing platform shoes to increase her height. He was so close that he stated her eyes were “sparkling and reddish-brown in color.” It’s almost like he was standing right next to her. Unfortunately for all of us, that description by Sir Baptista Spinola was a work of fiction – literally. The first evidence of this observation goes back to a book by Richard Davey and Patrick Boyle in 1909 – men who were obviously not present at the time of the event. Because of that statement many portraits have been modeled after his fictional description. Leanda de Lisle, author of “The Sisters Who Would be Queen” says that actual witnesses at the event reported that Guildford walked by Jane with his cap in his hand and that her mother was carrying her train. I need to take a minute to address the train carrying. It was highly unusual for someone with the pedigree of Frances Brandon to carry the train of her own daughter. What on earth did Frances Grey do to upset both Henry VIII and Edward VI – to be removed from the succession and be replaced by your daughter? I have no idea…if you know, let me know, because I don’t know. After making the announcement at the Tower, the heralds then moved on to proclaim their message throughout London. From the beginning, there were many who felt an injustice had been done. A boy lost both of his ears when he shouted out that it was Mary who was the rightful queen and not Jane. The reception Jane received was a cold one, for the most part, after the proclamation was read. Jane by the Grace of God Queen of England, France and Ireland, defender of the faith, & of the Church of England, & also of Ireland under Christ in earth the supreme head. To all our most loving, faithful, and obedient subjects, and to every of them greeting. Where our most dear cousin Edward the Sixth, late King of England, France and Ireland, defender of the faith, and in earth the supreme head under Christ of the Church of England and Ireland, by his letters patent signed with his own hand, and sealed with his great seal of England, bearing date the 21st day of June, in the 7th year of his reign, in the presence of the most part of his nobles, his councillors, judges, and divers others. It then goes on to explain the legitimacy, or lack there of for both Mary and Elizabeth. The truth was that Mary was a Catholic and Edward and his men had done all they could to rid England of Catholicism during his reign. Allowing Mary to inherit the throne after his death was seen unfavorably. All throughout London, notices were hung to announce the new Queen for those who were not present for the hearld’s announcement. As we now know, Jane’s father did not go – he grew ill with “fits” that would weaken him for months – it is believed he suffered from stress and anxiety. I also need to address the part about the duchesses of Suffolk and Northumberland is most likely a made up story, as they would have never been allowed into the meeting. The following day, on the 12th of July 1553, Mary traveled roughly thirty miles moving from Kenninghall to Framlingham Castle. It was at Framlingham that she really began to rally support. On that same day, the Lord Treasurer William Paulet, brought Jane the crown jewels, even though she claimed she never asked for them. It was decided that her coronation would not be for at least a couple of weeks, so there was no need. at the moment, for her to have the crown jewels in her possession. It makes me curious, why would the Duke of Northumberland not push Jane for a quicker coronation. Had the ceremony been performed immediately there would have been no question who the Queen was – she may have been considered a usurper but she would have been anointed by God. When Matilda, daughter of King Henry I, inherited the crown of England it took her so long to return to England from the continent that her cousin Stephen jumped at the chance and was crowned King Stephen before she had the opportunity to claim it. Things like that actually happened. This is the very reason the Duchess of Northumberland wanted Jane in London while the king was dying, so she would be ready. Why didn’t Northumberland schedule an immediate coronation? It makes me curious. With that question in mind I contacted my friend Claire at The Anne Boleyn Files – Claire knows a lot about the time period and it generally my go to person when I have nagging questions. Claire said that a coronation took much time to plan and that is why she believed it wasn’t done immediately. In my opinion, if they were worried, they could have rushed the plans and made it less of a spectacle. 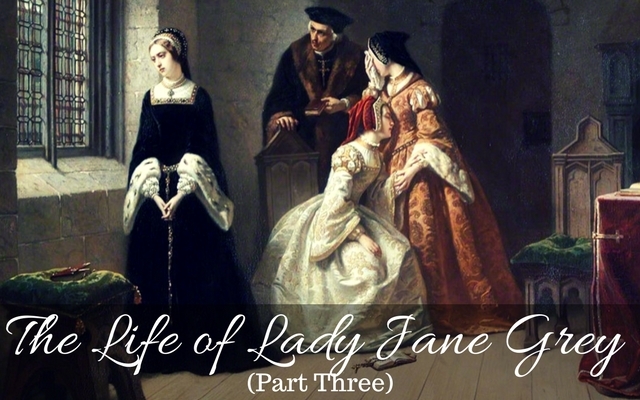 While the stories we are often told of Jane are of her weeping at the thought of being queen, the truth is that she was performing the duties of a monarch. And every day,Jane signed letters and papers with her name – “Jane the Quene” If she was reluctant I do not believe she would have signed it as such. I’ve always believed that she may not have wished the role at the beginning, but once she was in it she would fulfill her duties properly. For the next three days Mary’s supporters and forces grew. She gained support from men such as Sir Edward Hastings; Henry Radclyffe, Earl of Sussex; Sir Thomas Cornwallis; Thomas, Lord Wentworth; Sir Henry Bedingfield; John de Vere, Earl of Oxford. These men are big names for Mary to have on her side. In addition to them were many prominent families of eastern England. Mary was proclaimed Queen in various counties and towns due to her efforts. On the 15th of July the tide really began to turn against Jane when the royal ships guarding the Eastern coast for ‘Queen Jane’ swapped their allegiance to ‘Queen Mary’. Their crews had not been paid, and they received a visit from Sir Henry Jerningham (grandson of William Kingston – that name should sound familiar) asking them to support Mary instead, so it was an easy decision. It makes one wonder why they hadn’t been paid. I don’t know anymore than that. They brought the commander of the ship to see Mary and then the ships switched allegiance. Could it have been because Mary paid him the money that had been owed by Queen Jane’s establishment? Or maybe she just offered to pay in the future. Either way, they turned sides. On the 15th of July 1553, a letter was sent from a spy in France to the Emperor. The emperor had great interest in the events at English court. His cousin, Mary, was supposed to be Queen. France was looking at aiding the Duke of Northumberland in securing Jane. In the meantime, Jane continued to send letters to sheriffs and Justices of the peace and demanded their allegiance, saying: “Remain fast in your obeisance and duty to the Crown Imperial of this realm, whereof we have justly the possession.” Jane was determined to maintain her role. The Chronicle of Queen Jane also reports that at around 7pm on 16th of July “the gates of the Tower upon a sudden were shut, and the keys carried up to the Queen Jane”. Jane had ordered guards to be setup all around the Tower to help her maintain her possession of it. A couple of days later, on the 18th Queen Jane began to raise more troops. She had been upset and sent letters to those who would betray. She was sure that these rebels lacked the heart to continue on with their mission. She said these men should receive ‘such punishment and execution as they deserve’. But unfortunately her show of force was too little too late, the tide had turned and all appeared lost. While the Duke of Northumberland, and his army made their way from Cambridge to Bury St Edmunds to stand against Mary’s men, the Earls of Pembroke and Arundel called a council meeting and then betrayed Northumberland and Queen Jane. The men persuaded many council members that Mary’s claim to the throne was legitimate. With Mary now considered Queen of England, Jane, her father, the Duke of Northumberland and Guildford Dudley were now enemies of the state. There had to be consequences for usurping the throne. So the Council’s soldiers arrived at the Tower, and Jane’s father, Henry Grey was there to speak with them. They informed him that all was lost and that he must have his Tower guards put down their weapons. Grey complied. They also told him to he must ‘remove’ himself from the Tower at once. Also, if he did not read the proclamation that Mary was his Queen in public he would be arrested. Henry Grey once again complied. Grey had the unfortunate duty of informing his daughter that all was lost and that she was no longer Queen of England. Jane gracefully held her composure and reminded her father that it took much convincing at the beginning for her to accept the crown. The Duke of Northumberland was quick to pledge his allegiance to the merciful Queen Mary as well. If this had been Mary’s father, all those involved would have easily been executed for treason. Jane was moved from the royal apartment to a small house next to the royal apartments within the Tower. Her husband was placed in the Beauchamp Tower close by. Northumberland may have believed himself safe but on the 25th of July 1553, he and his sons Ambrose and Henry arrived at the Tower. The following day his son Robert Dudley and William Parr both arrived as well. On the 27th of July, Jane’s was saddened to see her father arrive at the Tower – they had all hoped that Northumberland would take the fall for the entire event. On the 29th of July, Jane’s mother and cousin to the Queen, Frances Brandon paid a special visit to Queen Mary. It was at this meeting that Frances pleaded with Mary that her family were the victims of John Dudley, Duke of Northumberland. Mary agreed to release Henry Grey the following day, but Jane was charged with treason had to stay in the Tower – it was too dangerous for Mary to release her. On the 3rd of August, Queen Mary made her formal entry into London. With her procession of nobles and courtiers took claim of the Tower of London. While this battle for the throne was shrouded in religion, Queen Mary made a point of issuing a conciliatory proclamation which promised a settlement of religion ‘by common consent’ – and said that people, in the meantime, should live under the religion ‘they thought best’. This was a smart move by Mary. Most people were terrified that she would immediately return England to Catholicism. On the 13th of November, Jane, her husband Guildford and his brothers Ambrose and Henry were tried for treason. The trial was public and was held at London’s Guuildhall. Jane Guildford were charged with high treason for taking possession of the Tower and proclaiming Jane as Queen. Jane was also charged with signing her name as Queen. They were all found guilty as charged. The men were to be hanged, drawn and quartered and Jane was to be burned alive or beheaded. It was reported that Jane remained calm during her trial and sentencing. Jane was determined that her death would have meaning. During her time in the Tower as a prisoner she truly devoted herself to her religion and found comfort in it. Even though Jane had been condemned to die there was no date given for her execution. It appeared at the time that her cousin, the Queen, might spare her life. Unfortunately for Jane, the year 1554 brought trouble, by way of Thomas Wyatt and Wyatt’s Rebellion. The point of the rebellion was to remove Mary from the throne and win it for Elizabeth (another Protestant) because Mary was looking at marrying a foreign prince, Philip of Spain. However, many believed at court that the intent was to place Jane back on the throne of England. But, as history tells, Wyatt’s Rebellion a failure – the only thing it succeeded in was the execution of Jane and her husband. Guildford was led to the scaffold, where he said few words, kneeled down and said his prayers. After reading a psalm from her book she stood up, and gave her gloves and handkerchief to Elizabeth Tilney, and her prayer-book to Master Thomas Bridges. She then untied her gown. The executioner went to assist her but she adamantly declined his offer and turned to her ladies. It was after all that that her eyes were covered with a blindfold. The executioner then knelt down and asked for her forgiveness in which she willingly forgave the men for what he must do. She said to him, “I pray you dispatch me quickly”. Blindfolded, Jane was unable to locate the block in front of her. She had a moment of panic and said, “what shall I do?’ ‘Where is it?’ A person nearby (it does not say whom) guided the frightened young woman to the block.